Give a call to Hayfield Minnesota's top insulation contractor. We're the best source for attic insulation, injection foam, ice dam removal, soundproofing, blown-in insulation and more. Today's insulation products are better than ever. If you're looking to improve your home's insulation than finding the right contractor for the job is a #1 priority for your home. Nobody knows insulation like us. We're one of the only insulation contractors in Hayfield to use BPI certified contractors on every insulation job we undertake. Insulation is one of the easiest and most affordable ways to improve your home's energy efficiency level. Many homeowners are surprised at how quickly an insulation job pays for itself, through reduced heating and cooling costs. The answer isn't a new sweater, its better insulation. Ryan's also hosts one of Southern Minnesota's only insulation showrooms, where you can view different insulation products, get answers to any questions you may have and more. We offer free in-home estimates to people living in Hayfield, so call today! If your curious about the benefits of soundproofing and want an estimate give us a call. Ryan's does soundproofing for both commercial and residential structures. Our special acoustic insulation is great for soundproofing projects, and is more affordable than ever. Give us a call today for a free estimate. Some homes in Hayfield experience ice dams. Ice dams can often be reduced or eliminated by increasing or upgrading your attics insulation. During the winter Ryan's offers a fast ice dam removal / prevention service. 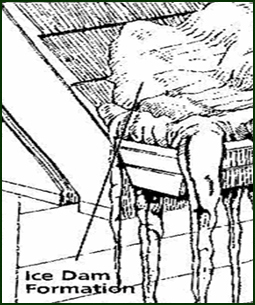 If your Hayfield home is subject to ice dam formations give us a call.